We're proud to partner with a sustainable brand like Cafe Campesino. This Georgia coffee roaster connects foodies who care (like you!) with sustainably-grown, ethically sourced, delicious coffee. Meet the people behind your morning cup! 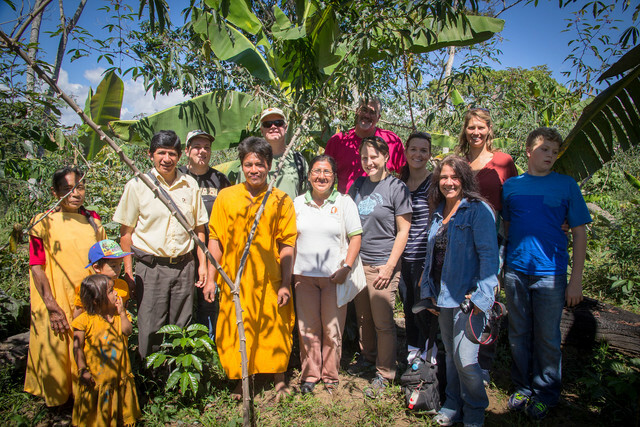 Cafe Campesino co-founder Bill Harris (center) with customers and fellow roasters on a 2014 visit to the CAC Pangoa cooperative, located in the central Amazon region of Peru. This is not only true from a business perspective where, as a specialty coffee company, we have a responsibility to our key stakeholders (and shareholders) to sell the fair-trade, certified organic coffee that is laboriously hand-harvested from the sides of mountains. But it’s also true from an environmental perspective. The more demand that we can create for sustainably-sourced, certified organic coffees, the cleaner the water run-off is in the world’s coffeelands. 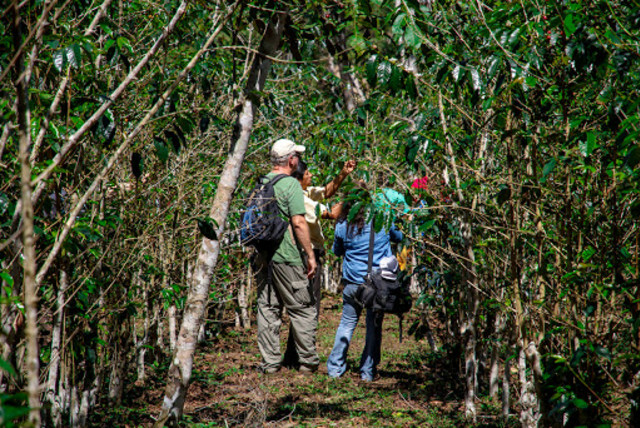 The more coffee is grown under a shade-canopy (rather than in full-sun), the more bio-diverse coffee farms become. Healthy soils surround coffee plants and teem with life that feed and care for the trees. Those coffee trees, in turn, sequester carbon from the atmosphere, and a patchwork of healthy farms around the world help regenerate the planet’s overall health. Then there’s the human perspective. The most labor intensive part of the supply chain happens before coffee is ever imported or roasted. Harvesting, processing, sorting and preparing coffee beans (or seeds) for export is all done in coffee-producing countries. It’s hard not to think of the people behind your morning cup when you start to understand how the coffee supply chain works. “We all want to be happy and live good lives. We just don’t have to do at the expense of each other,” I heard a Colombian exporter working exclusively with small-scale farmers say a few years back. It’s true. We can all do our part to support one-another and buttress systems that work in the best interest of all. At Cafe Campesino, we source exclusively from small-scale, farmer-owned cooperatives, because we believe the cooperative model is the best system for small-scale coffee farmers to mitigate risk and survive in a highly volatile market. We practice business transparency, because we believe the best way for consumers to know how you operate your business, is to let them see it for themselves. We make our coffee contracts public on our website, and we open up our business to the scrutiny that is required to achieve B Corp and organic certifications. That shared sense of responsibility- an understanding that if we are successful, small-scale farmers will be successful- is what keeps companies like ours going. We invite you to join us. Vote with your fork.. Or your coffee mug. Or both. We can assure you there’s a great group of farmers, (and exporters, importers, roasters, coffee shops, baristas, restaurants, servers and chefs) all around the world who know that their success and survival is inextricably linked to your experience as a consumer. Cafe Campesino is a fair trade, organic coffee company that opened in Americus, Georgia, in 1998. It operates a restaurant and coffee shop, as well as a roastery and Specialty Coffee Association coffee training lab from Americus. Cafe Campesino visits coffee producers 2-to-3 times per year and sources from the same farmer co-ops every year. It is a certified B Corp and founding member of the green-coffee importing cooperative of roasters, Cooperative Coffees.